Nathan Bombrys tells a tale of champagne waiters, mahogany furniture and a dazzling silver fireplace. The Glasgow Warriors managing director has entered the lair of his counterpart in Toulouse, hours before their teams lock horns in the European Champions Cup, to enjoy the finest in pre-match hospitality. The place, he says, was vast, its sprawling interior festooned with regal auburn fixtures, the walls bedecked by myriad trophies and medals - all centred around that immaculate hearth. The contrast with Bombrys' own Scotstoun surroundings may be stark, but the same can no longer be said for his club. Their cavalier rugby and shining success - reaching the last four of the Pro12 in 2012 and 2013 and the final last year - has drawn great acclaim amid the barren recent history of Scottish rugby. This glimpse of Gallic flamboyance, however, proffered a reminder of the gap Glasgow must yet strive to bridge - a caveat that keeps Bombrys grounded, while simultaneously driving his hunger to deliver sporting prosperity to Scotstoun. "We were sat at the (Pro12) final last year away at Leinster - we'd had a good season, but they're announcing 13,000 season ticket holders for the seventh straight year," says the 40-year-old. "You see the sponsors they have, you see their big 18,000 stadium sold-out most of the time, and their Heineken Cups, you do realise we've got a long way to go." Bombrys, the son of two high school coaches, hails from the wilds of Michigan and grew up immersed in sport, graduating from Syracuse University where he stumbled across rugby, and found himself transfixed by its values and ideals. "I never saw a rugby ball until I went to Syracuse," he says. "I thought: that's the game for me; it was just the funnest game I'd ever played. "But also because of the camaraderie and international nature of rugby, it opened up the rest of the world for me. "I had a Kenyan scrum-half with dreadlocks who was going to start the African Revolution - until we met his mum and she was a ginger-haired banker from Nebraska. "I had a number eight from South Korea and his father was one of the ministers in South Korean government - he was a big, bruising eight, and his bodyguard was another of our scrum-halves. "It just opened up the fact there was a bigger world out there than what I'd experienced before." He headed for Glasgow in late 2011 after spells in the top offices of basketball outfit London Towers, Sale Sharks in the Aviva Premiership, and the Scottish Rugby Union's HQ at Murrayfield. His first task was to oversee the club's move from Firhill to its now-established base in the city's west end. In the months and years since, subtly, gradually, he has set about eroding lingering perceptions of rugby as a sport for the privileged in a city dominated by the omnipotent, ravenous beast of football and all its social and cultural implications. "When I started, I met some former Glasgow captains who spoke about the different places they played and trained," he begins. "They did their weights in one part of the city and their rugby in another. "Scotstoun's a big part of giving us an identity. We've gone from 700 season tickets in our last year at Firhill to over 3,500 this year - we got to the point where we couldn't sell any more for a period of time - and from six sponsors to about 80. "Early in the job it was made pretty obvious to me, when I would speak to people in the rugby community, some would say they didn't have the greatest relationship with Glasgow Warriors. "Scottish Rugby owns Glasgow Warriors, who in turn are owned by the clubs, so we want them to see us as an extension of themselves. We send players out to clubs regularly, but clubs are giving us a brief. "The players are the ones doing the work; they're getting in the car and going out to clubs. And it's nice they're doing it because they want to. Winning games is important, but so is growing the club." Now, however, the Warriors have arrived at something of a crossroads in their evolution. 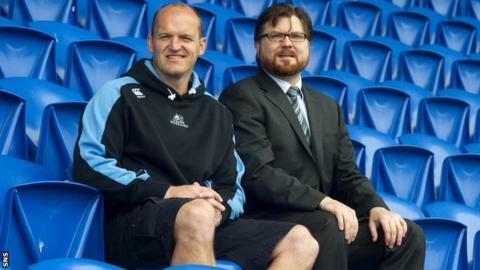 Big names, fan favourites and old faces are leaving - captain Al Kellock and Shade Munro, a long-standing lieutenant of head coach Gregor Townsend, have been around for years. So too Dougie Hall, while the eccentric genius of Niko Matawalu, record try-scorer DTH van der Merwe and 'kilted Kiwi' Sean Maitland will all depart Scotstoun at the season's end. Signings have been made - internationals like Mike Blair and Simone Favaro among them, while Dan McFarland of Connacht replaces Munro - and more will soon follow, but as first-place Glasgow pursue the Pro12 title, off the pitch supporters may be forgiven for eyeing the comings and goings with unease. "We have retained some of our top players - there's a hidden cost that perhaps supporters don't always see," explained Bombrys. "We've retained key players: Stuart Hogg, Tommy Seymour, Henry Pyrgos, Josh Strauss, Leone Nakarawa, Adam Ashe, Lee Jones and Peter Horne. "By no means is it cut-backs, or driven by book-balancing. That's only a part of it. We're well supported by Scottish Rugby and we have some exciting signings yet to bring in; we believe we've spent wisely. "At least two of the guys leaving are real favourites to the supporters - I watch the games as well, these guys have played some really good rugby for us. But I wouldn't be worried, there's a plan, and there are opportunities for players to develop, and other players to come in and fill those places." It would be foolhardy indeed to question the nous of men who boast the pedigree of Townsend and Bombrys, but even for them, life in Glasgow was not always thus. "When I first started I said something to the coaches and management and all the staff," says Bombrys, recounting his address. "I said: 'I want to work for a club that wins the Pro12 and wins the European Cup,' and there were a few sniggers at the back of the room. But there aren't any sniggers any more. "We used to dream about having a home semi-final, getting 10,000 and selling it out - we did that last season against Munster. Now we're talking about winning that trophy, going to a big final and winning. "We haven't done that yet, but the belief that's been generated that we can do that, that's what's rewarding, that's what you look forward to." Bombrys travels across Europe, soaking up twin-tier stadia, monstrous gate receipts and Test-scale matchdays, always watching through keen eyes, always learning, always seeking improvements for his club. For all that Glasgow may have many rungs still to ascend on the Euro-ladder, perhaps the motto of his home state should serve as testament to the progress they have made: "If you seek a pleasant peninsula, look about you."